As Newsrooms Cut Back, Who Covers the Statehouse? There are usually 11 reporters who make their home offices in the fourth-floor newsroom of the slightly Gothic marble and granite Connecticut State Capitol building in Hartford. Seven of them work for newspapers, two for radio, one for the AP and one of them, Christine Stuart, is the Connecticut News Junkie. On any given day at CTnewsjunkie.com, there are stories about Connecticut's budget woes, health care issues and Senator Chris Dodd's attempts to reform the credit card industry. Most of the stories are written by Stuart. All the photos are taken by Stuart. And Stuart or her husband, who works as a layout editor at a local paper, handle most of the ads, which are for local unions or the Connecticut Dairy Farmers Association. So far, her best month garnered her site 67,000 page views. But Stuart, 31, who has to have a part-time job to make ends meet, says she is treated, more or less, as an equal by the other reporters in the office. "One of them told me, 'You have to make it, because you're the future.'" Statehouse coverage is the bread and butter of a newspaper: unsexy and repetitive, but one of the foundations of a nutritional news diet. Unlike bread and butter, however, it can be expensive. Reporters have to monitor long, complicated funding debates  about schools and roads and health care  many of which do not result in front-page news. Uncovering corruption, incompetence or waste takes an inordinate amount of time and effort. As newsrooms and newspapers have become smaller, coverage of state politics has been among the first to get cut. Who was hammering home this point at Congressional hearings on May 6 on the future of newspapers? The Wire creator and former newspaper reporter David Simon. "What is not being addressed" by successful aggregator sites such as the Huffington Post, he noted at a hearing chaired by Massachusetts Senator John Kerry, "is reporting at the state and local level. It's the regional level that's collapsing." Bloggers do not tend to hang out in the local statehouse, courthouse or police station. "There's no glory in that kind of journalism," he said. "The next 10 to 15 years will be halcyon days for local corruption. It's going to be a great time to be a corrupt politician." He's probably right. 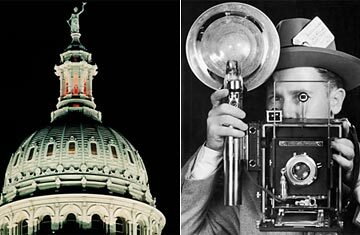 According to a survey published this spring in the American Journalism Review, there are 355 full-time newspaper reporters at state capitols, down from 524 six years ago. Thirty-five reporters worked out of the statehouse in Trenton, N.J., in 2003; now 15 do. Sacramento had 40 reporters; now it has 29. Austin dropped from 25 to 18, Atlanta from 14 to 5. Only Rhode Island and Oregon have more journalists working the state beat than in 2003. So who is trying to fill the breach? There's Stuart's labor of love in Connecticut. In Texas, Trent Seibert, 38, formerly of the Nashville Tennesseean, founded Texas Watchdog in August, with a grant from the Sam Adams Alliance. The site has launched feisty investigations into state lawmakers' doings. It recently filed Freedom of Information Act requests for access to the Lieutenant Governor's calendar as well as Houston Mayor Bill White's email correspondence with a developer. Unlike Ctnewsjunkie, which casts a wide net, or sites like the nonprofit Minnpost.com, which is run by the former editor of the Minneapolis Star-Tribune, Texas Watchdog doesn't try to cover everything  or to compete with the big guns. "The other papers mostly see us as colleagues who supplement their work," says Seibert, who is based in Houston. He has three full-time staff and three part-time. "Our biggest story so far concerned the ethics forms every lawmaker has to fill out, detailing their business interests," says Seibert. Even though they are putatively public documents, the legislature refused to put them online. After Texas Watchdog posted them, he says he "was amazed at how hungry Texans were to know this stuff." He got calls from people pointing out questionable links they had found among the some of the legislators' papers. The site's future is uncertain, however. "We've been able to piece together a budget until the end of the year," says Seibert. "Beyond that, I have no idea." One of the site's more innovative income streams is from running seminars in which journalists teach laypeople how to use public records to research their local school or check on City Hall as well as how to use state and federal freedom-of-information laws. Watchdog is also in the process of becoming a not-for-profit. It is applying for more grants and is considering seeking advertising. But it's not as easy to interest advertisers in statehouse-centric sites as it is to get ads for local restaurants, arts and travel stories. Several promising state-focused enterprises have already petered out. For example, the Politicker network, which set up political news sites in 17 states in early 2008, closed 12 of them in December and another three in January. It now operates only in New York and New Jersey. Seibert and Stuart know the odds are not stacked in their favor. "I'm going to do what I can to keep this alive," Seibert says. Plus, he adds, "I'm having fun in journalism for the first time in a long time."